Purnululu NationalPark, located in the Kimberley region of Western Australia, covers almost 240,000 hectares of remote area managed as wilderness. It includes the Bungle Bungle Range, a spectacularly incised landscape of sculptured rocks which contains superlative examples of beehive-shaped karst sandstone rising 250 meters above the surrounding semi-arid savannah grasslands. Unique depositional processes and weathering have given these towers their spectacular black and orange banded appearance, formed by biological processes of cyanobacteria (single cell photosynthetic organisms) which serve to stabilize and protect the ancient sandstone formations. These outstanding examples of cone karst that have eroded over a period of 20 million years are of great beauty and exceptional geological interest. Although Purnululu National Park has not been widely known in Australia until recently and remains relatively inaccessible, it has become recognized internationally for its exceptional natural beauty. 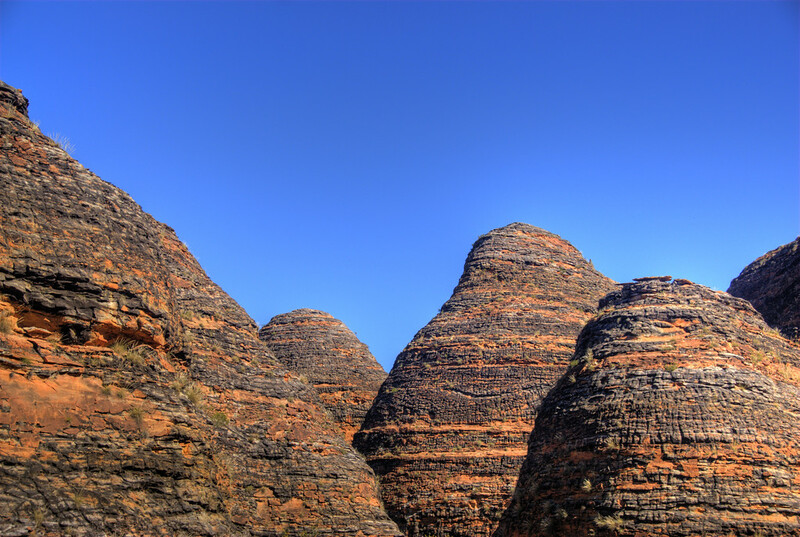 The prime scenic attraction is the extraordinary array of banded, beehive-shaped cone towers comprising the Bungle Bungle Range. These have become emblematic of the park and are internationally renowned for Australia’s natural attractions. The dramatically sculptured structures, unrivaled in their scale, extent, grandeur and diversity of form anywhere in the world, undergo remarkable daily and seasonal variation in appearance, including striking color transition following rain and with the positioning of the sun. The intricate maze of towers is accentuated by sinuous, narrow, sheer-sided gorges lined with majestic Livistona fan palms. These and the soaring cliffs up to 250 meters high are cut by seasonal waterfalls and pools, creating the major tourist attractions in the park with evocative names such as Echidna Chasm, Piccaninny, and Cathedral Gorges. The diversity of landforms and ecosystems elsewhere in the park are representative of the semi-arid landscape in which Purnululu is located and provide a sympathetic visual buffer for the massif. Purnululu is hard to get to. It is in the outback of the outback. It is three hours from the Turkey Creek Roadhouse (truck stop), which is three hours from the town of Kununurra….which is in the middle of nowhere. The primary attraction of Purnululu is the erosional features of the Bungle Bungles. The beehive domes are the most famous feature, but the gorges are also stunning. The photo above is of Cathedral Gorge. Click on the photo to see the larger version of the photo get a sense of scale. The woman is the photo was our bus driver/tour guide for the day. Purnululu is only open a few months each year during the dry season. During the wet season, the creeks can get very high with very rapid currents. Purnululu National Park is a Natural UNESCO World Heritage Site located in Western Australia’s East Kimberley region. The national park measures at nearly 234,000 hectares in land area. The park was established in 1987 but was inscribed into the UNESCO list in 2003. It is currently managed by the WA Department of Parks and Wildlife. The Purnululu National Park is best known for the Bungle Bungle Range or sandstone domes that rise 578 meters above sea level. These domes also exhibit an alternating stripe of orange and grey bands that make these domes more visually striking than they already are. 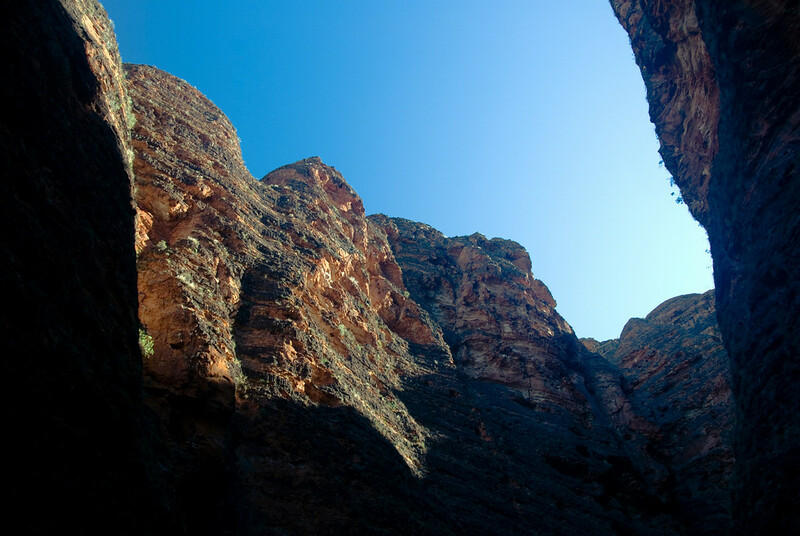 To get to Purnululu National Park, you can travel by road via the Spring Creek Track. By the end of this track, you will find the park’s visitor center. The track is 53 kilometers in length and is accessible only during the dry season. It is therefore recommended that you check the weather or season prior to your planned visit, especially if you wish to access this track to get to the park. There are also helicopter flights that provide service to the Purnululu National Park. This is a less demanding way to travel and you can take off from the Bellburn Airstrip. Australia is not alien to unique landscape and geological formations. 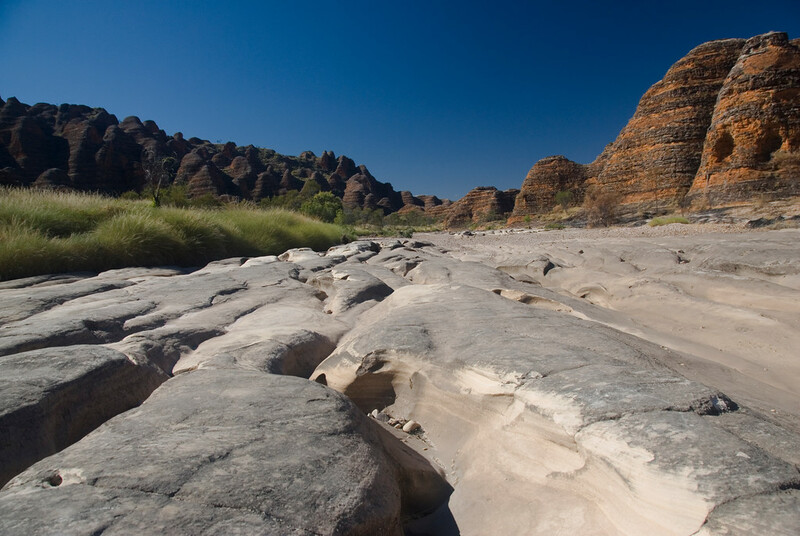 However, Purnululu National Park and its Bungle Bungle Range are a unique specimen. The sandstone towers, domes, and banded beehive structures are a result of millions of years of weathering and erosion. The bands that appear on the sandstone domes were due to the presence of cyanobacteria, which provides a beautiful contrast against the light orange color of the sandstone. Cyanobacteria is one of the oldest life forms on Earth; hence, this speaks to the number of years that these structures had evolved. Another interesting feature about the beehive domes and sandstone towers at Purnululu National Park is that the appearance changes with every season. Even after the rain, the colors of the towers and domes change remarkably. The scientific value of the karst and sandstone formations at Purnululu National Park isn’t to be dismissed either. For more than 25 years, geomorphologists have studied the cone karst formation on the sandstone and they have not come into a conclusion about what could have caused this natural phenomenon yet. Aside from the towering domes and sandstone structures at Purnululu National Park, there are several other notable landscape and geological formations at the park. From gorges and waterfalls, you can find the most picturesque outback landscapes in this national park. Scientists believe that the variety of biological features within the park showcases how the neighboring desert environment and rainfall-rich zones adapt to the season. If you can, hire a flight over the park so you can enjoy the imposing sight of the Bungle Bungle Range and the surrounding landscape. 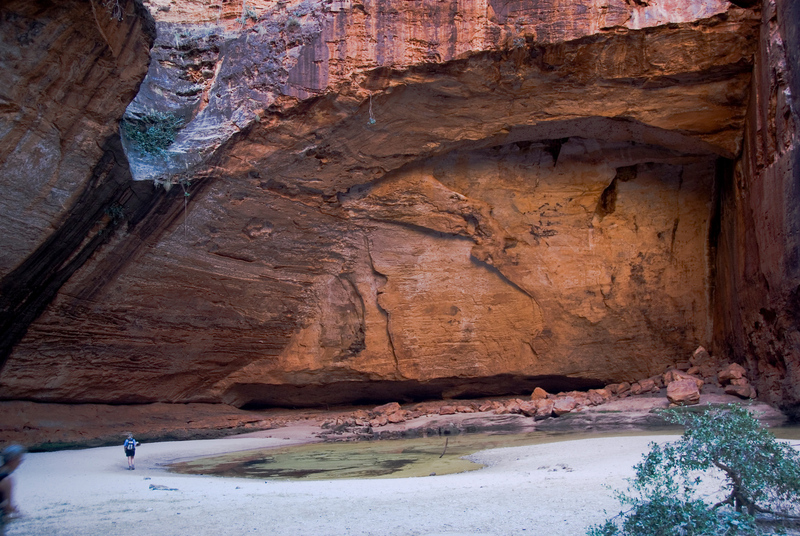 Several visitors explore the Purnululu National Park on foot and most explore the Piccaninny Creek route. Some even take an overnight camping experience. There are two campgrounds in the park: Kurrajong and Walardi. If you plan to camp, you need to carry your food and water since there are no nearby shops to get your supplies from. The last 53 kilometers of the park consists of a rugged terrain. This area of the park is only accessible by 4WD vehicles. 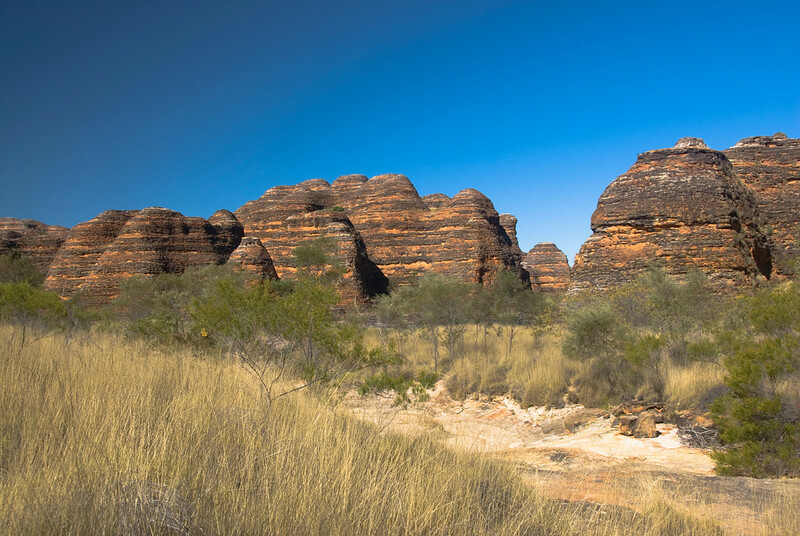 View the complete list of UNESCO World Heritage Sites in Australia. View the list of all of the UNESCO World Heritage sites I have visited on my travels.